HomeCityWho will be Buffalo’s next Mayor? As Deputy Mayor Steve Casey prepares to leave City Hall, political observers expect Mayor Byron Brown to forgo a fourth run for the office. It has been long rumored that Brown will pursue a lucrative position in the private sector. With his top political operative on his way out, who many referred to as “the Mayor’s iron fist,” those rumors are only reinforced. A native of Philadelphia, Casey was known across Buffalo for his hard charging tactics and was thought to be Brown’s most trusted advisor. Casey is even credited with pushing former Human Resources Commissioner Karla Thomas out of her office, despite her confidant-status with the Mayor. His detractors call him a tyrant who used bullying, threats, and bile to keep his political machine in line and his operatives in lock-step. 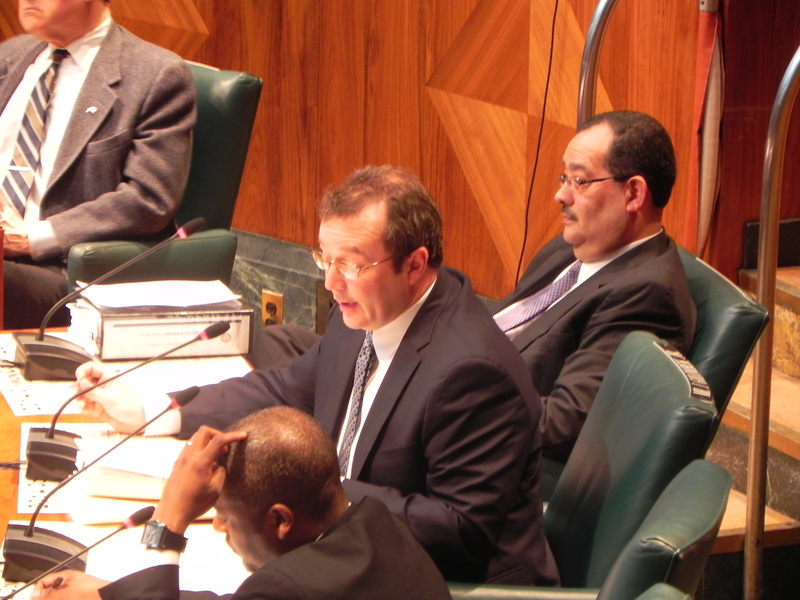 Commissioner Thomas even referred to the Deputy Mayor, in an open letter, as “a cancer” on the Brown Administration. Now, with neither Casey or Thomas involved in the Brown Administration, it seems that the Mayor wouldn’t have the political team in place to run for reelection — even if he wanted to. The organization known as Grassroots, which was long considered the political power structure in the African American community, is in chaos and resentment of the Mayor has been inflamed by various factions. They say that the Mayor has done very little to help the black community — even at a time when Governor Cuomo has been shoving money into Buffalo’s economic comeback. So understandably, all eyes are on who might fill the Mayor’s office at this inflection point in our economic comeback. Will the powers-that-be coalesce around a seasoned politician, look to the private sector, find an intergovernmental affairs expert, or embrace an activist outsider? Only time will tell, but here are the people who the politicos are talking about. Kathy Mecca is universally recognized as Buffalo’s best community organizer. For nearly two decades, the Columbus Park Association has fought the Public Bridge Authority’s relentlessly foolish effort to demolish broad expanses of the historic West Side neighborhood where her family has lived for generations. With a team of her friends an neighbors, they’ve mobilized the community around the city’s most pressing environmental justice issue. Since the passage of NAFTA in the mid-1990s, truck traffic at the Peace Bridge has skyrocketed, and with it, has pushed tons of diesel carcinogens into a largely poor and minority community that now suffers from a childhood asthma epidemic along with elevated rates of cancer, stroke, and neurological disorders. Mecca has been a passionate, articulate, and tireless leader. 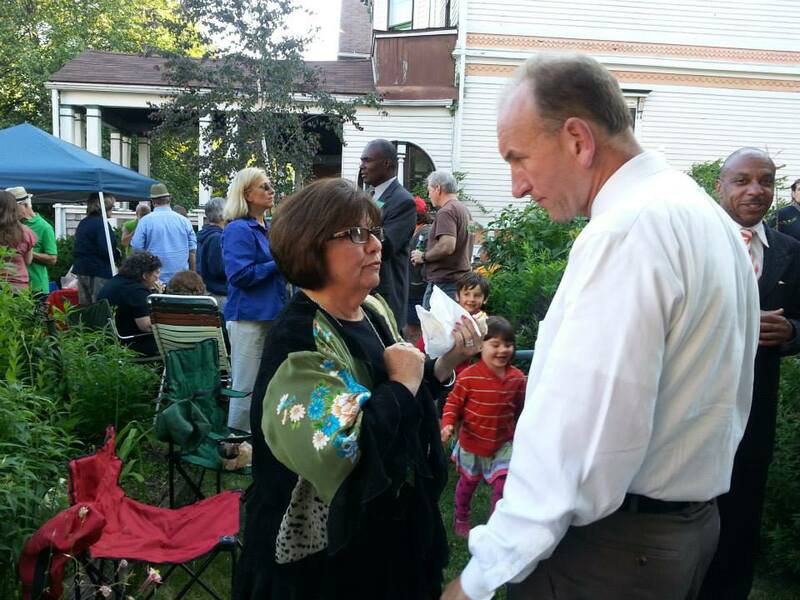 Columbus Park Association President Kathy Mecca talking with City Comptroller Mark Schroeder with Common Council President Darius Pridgen looking on, and former Mayoral candidate Bernard Tolbert speaking in the background. They say that no other developer in Buffalo carries himself with the sense of civic responsibility that drives Rocco Termini. The guy who restored the Lafayette Hotel to its original grandeur is beloved by the preservation community, a formidable movement that has been searching — desperately — for political leadership. Termini is something of an activist, playing a pivotal role (with Buffalo’s Young Preservationists) in saving the Trico Building, advocating for reforms to the State’s Historic Preservation Tax Credits, searching for a way to bring back the AM&A’s building, and taking a pioneering approach to preservation-oriented development in the Pierce Arrow neighborhood of Blackrock. Termini is broadly popular, has a well known public profile, and has the resources and relationships to fund a competitive campaign. Developer Rocco Termini with State Senators Mark Grisanti (left) and Tim Kennedy (right) outside Downtown Buffalo’s historic Lafayette Hotel while it was under renovations. The recently wed preservation power couple Jason Wilson and Bernice Radle tied the knot in a style all their own: at Silo City along the Buffalo River. The two founded Buffalove Development and are inspiring an urban reinvestment movement on the West Side, as they save one historic property after the next. In a New York Times article Ms. Radle expressed her interest in running for Mayor. She has a robust following of planners, preservationists, and environmental activists who are foot soldiers in the Do-it-Yourself preservation movement that is sweeping the West Side on the tails of a residential real estate boom that they have in part created. Preservation power couple Jason Wilson and Bernice Radle, newly married, and co-founders of Buffalove Development. Assemblyman Mickey Kearns is the most popular Irish politician from South Buffalo since former Mayor Jimmy Grifin. He took his Assembly seat after a special election landslide in which he trounced the establishment-backed challenger, Rep. Brian Higgins’ staffer Chris Fahey, despite running on the Republican line in an overwhelming Democrat enrolled district, the Congressman’s taxpayer funded political machine, and over $150,000 from Speaker Sheldon Silver. His performance was so strong — and his base of support so deep — that he doesn’t even have a challenger this year. Gerald Steven Pigeon has been a political professional all his life. As a young man, he was the quintessential activist, first stuffing envelopes for the 1972 Assembly campaign of Vincent Graber. In 1977, when he was 17, Pigeon began working on Jimmy Griffin’s successful campaign for Mayor, with whom enjoyed a long relationship, but also initiating a decades long feud with Joseph F. Crangle, the notoriously hard nosed head of the Tonawanda-based faction of the Democratic Party. At 24, Pigeon managed Gary Hart’s presidential campaign in New York. He served in the Erie County Legislature, and as a special assistant to Health and Human Services Secretary Donna Shalala in the Clinton Administration. Political insiders say that Pigeon has enormous experience in intergovernmental affairs and an extraordinary network of relationships that could yield Buffalo legitimate national influence. Political insiders say that Pigeon has created more jobs in the private sector, lobbying on behalf of clients, than Mayor Brown in all three terms combined. But he doesn’t gloat. That’s not his style. Government affairs expert G. Steve Pigeon with former President Bill Clinton and Paychex founder Tom Golisano, at Clinton’s home in Chappaqua, NY. Pigeon, Golisano, and Clinton are longtime friends. His constituents know him as the honest and hardworking Councilman who has provided real leadership on citywide issues ranging from air quality on the West Side, investigating the Obama Administration’s cover up of a frivolous federal environmental review document, and providing a visionary voice on issues like highway removal and the Scajaquada redesign. He has often been called “the Maverick on the Common Council,” as he avoids the unthinking political alliances that tie his colleagues hands like puppets. His independence, his comfort bucking the powers that be, and his grounded character are what we should all look for in politicians. North District Councilman Joseph Golombek. As the Executive Director of the Buffalo Niagara Riverkeeper, Jill Jedlicka has made the region’s water quality central to our policy discourse. The organization played a key role in the dredging of the Buffalo River, launching of innovative storm water retention initiatives, and has aggressively educated the public on the sewage discharges that are common place with our antiquated combined sewage system. Jedlicka is widely respected and well plugged into political circles. The Buffalo Niagara Riverkeeper’s Executive Director Jill Jedlicka, being interviewed by WBFO. Senator Tim Kennedy has classic strengths as a politician: he’s likable, he’s down to earth, he treats each voter like they matter, and he has worked hard to reach out to diverse constituencies, even attending Sunday mass at various eastside churches. Kennedy has been loyal to the Senate Democrats and has built a very close relationship with Sen. Andrea Stewart-Cousins who leads the Democratic caucus and is expected to lead the State Senate after the coming the election. Connections like that could make Kennedy a political dynamo if he proves himself capable of raising downstate money to build a citywide political machine. Though he is close to longtime Congressman Brian Higgins, who has been called a Democrat-in-Name-Only, Kennedy has taken far more liberal positions on reproductive rights, marriage equality, and waterfront development. Senator Tim Kennedy with Assemblyman Sean Ryan and supporters outside of the Erie County Board of Elections. Despite recent controversy over his Chairmanship of Synacor, a publicly traded technology company located in the Waterfront Village, Jordan Levy is an enormously wealthy and successful venture capitalist with a pro-Buffalo posture. He is a partner at Softbank Capital and founder of Seed Capital Partners. He formerly chaired the Erie Canal Harbor Development Corporation, but after years of a delayed Bass Pro project, his chairmanship ended in a lackluster way. Still, Levy moved on to fight hard for Buffalo on his next project: the founding of z80 labs, a state funded tech incubator located at Canalside, where Levy mentors young entrepreneurs and helps finance the launch of new startups. He also helped architect the StartUp New York business plan competition. The bookies have selected Reverend Darius Pridgen, founder of True Bethel Church as the most likely next Mayor, but some controversies are emerging that throw the entire prospect into doubt. Pridgen spearheaded the construction of an affordable housing project on a former industrial site adjacent to his ministry. Residents are now getting very sick and a playground has been boarded up. Some congregants are starting to ask why the Church is profiting off a development project that has been making people sick, and why proper remediation work wasn’t done before housing grants for the project were issued. Common Council President Darius Pridgen (D-Ellicott District) speaking with Councilman David Rivera (D-Niagara District).